Sunday’s London-Surrey Cycle Classic will simultaneously offer a glimpse of 2012’s road race, a trial run for those vying for gold, and a never-to-be-repeated chance to upset the big boys for Britain’s smaller racing teams. The British and the Australians are the two nations that have sent their strongest line-ups, with the home riders boosted by the presence of an England squad as well as a British one. 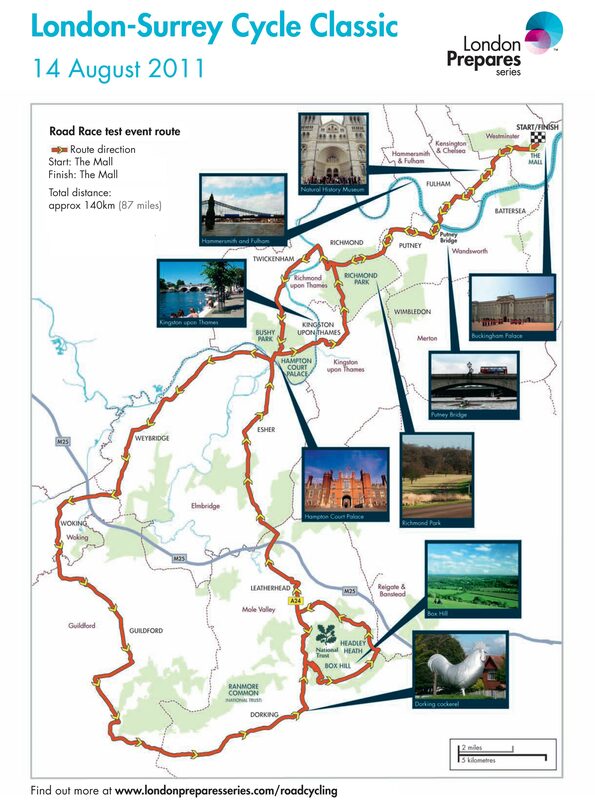 The race’s course is a shortened version of the one planned for 2012, and will cover two laps of the Box Hill circuit as opposed to nine. With a long run-in to the finish line from Box Hill, the actual Olympic route is being tipped as one for the sprinters and this should be all the more true for Sunday’s race, with so much climbing not included. The overwhelming favourite is Mark Cavendish (Great Britain), who will undoubtedly be keen to get a taste of victory on The Mall. However, there will be no shortage of riders keen to cause an upset in such a prestigious location. The Australians have included Matt Goss and Heinrich Haussler in their squad, and either of those riders have the speed to cause Cavendish problems. The strength of their team, which includes Olympic track medalist Stuart O’Grady and Team Sky’s Chris Sutton, will without doubt provide them with a strong lead-out. Tom Boonen will be representing Belgium and, although he is not as quick as he used to be, he should be in the mix on The Mall. Other big names include Sylvain Chavanel and Romain Feillu (both France) and Tyler Farrar (USA). For many British teams, Sunday represents the biggest race they will ever enter. For minnows Corley Cycles and Cyclepremier.com-Metaltek the race is a once-in-a-lifetime opportunity to make an impact at a level of the sport they would not normally get close to. Britain’s UCI Continental teams such as Rapha-Condor-Sharp, Endura and Motorpoint will also be relishing the opportunity to cause a big upset, and the stronger domestic riders such as Ian Bibby (Motorpoint) and Ed Clancy (Rapha-Condor-Sharp) will be hoping to make some impact on proceedings. Unfortunately, the Olympic road race, and Sunday’s race with it, has also been mired in controversy after organisers declared the Box Hill climb effectively off-limits to the public (more information below). Sunday’s route covers 140km from The Mall, out into Surrey and back again. It heads out of London over Putney Bridge and through Richmond Park, before heading north of the Thames and running southwards to Hampton Court. It then runs south through Weybridge, Woking and Guildford, and turns east towards Dorking. From Dorking, the race does two laps of the ‘Box Hill loop’, which heads up the Box Hill Zig-Zags climb and loops round the top of the hill before descending to Leatherhead. The lengthy and flat run-in takes the race back to Hampton Court, from where it approaches Richmond Park from the south before returning to The Mall on the same roads it left London on. Readers are advised that access to Box Hill is severely limited, with the only specified wristband-holders allowed onto the Zig-Zags. Other areas are restricted by capacity. 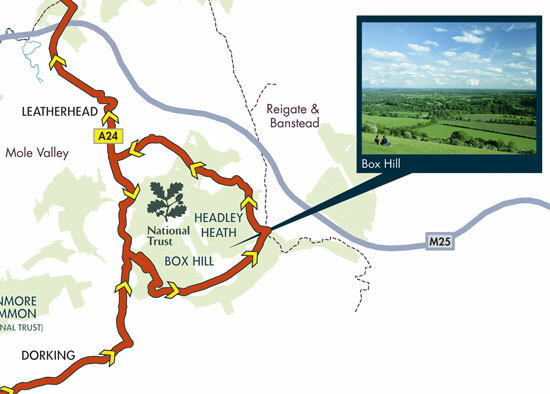 The only Box Hill area not restricted is a stretch of the A24 by Leatherhead. With the Zig-Zags area fenced off, access for those with wristbands is via the Zig-Zags turning at the bottom of the hill. Highlights will be shown on BBC the weekend after the event. Details to follow.